Education is meant to broaden the mind, and nothing achieves that better than a term or two studying abroad in a foreign country. The opportunity to see and experience a different land, to immerse oneself in the culture, and to soak up the historical and artistic legacy of another country is unmatched in its ability to give students a new perspective on themselves and their own homeland. Spain, with its rich European history, is one of the most popular study abroad destinations, and continues to draw American college students to its shores. Students of art and architecture will find Spain a surprising mix of Classical, Gothic, and Modern innovation. History, archeology, and social science majors will be fascinated by the country’s long, and sometimes turbulent, history. Whatever the course of study, Spain offers American students a unique opportunity to combine education with life changing cultural experiences. Modern Spain is a very multicultural country, and American students will have no trouble assimilating once they arrive. While a good command of the Spanish language is a plus, students will find that many Spaniards speak English. Students studying in Spain will find that many of their classes are taught in English. Students will also begin plenty of opportunities to learn Spanish while they are visiting the country. College students wishing to study in Spain will find a variety of study abroad scholarships designed to help them pay for their time abroad. Scholarships may be full or partial, with most programs offering funds to cover part of a student’s education expenses. Typically, students will be responsible for paying for their travel costs, plus room and board. Students planning on studying abroad will first need to make sure their passports and travel visas are in order. American students may stay in Spain for up to 90 days without a student visa. Any student whose course of study extends beyond 90 days must apply for a student visa at the nearest Spanish consulate. Getting a student visa can take several months, so students are advised to begin the process as early as possible. Typically the consulate will require a letter from the hosting university detailing the length of the student’s stay. Applicants will also need to show a passport, proof of medical insurance, and proof that they can financial support themselves while in the country. The American Institute for Foreign Study offers a wide range of partial scholarships for students interested in pursuing their studies in Spain. These programs target a variety of student types, including minorities, women and low-income students. The AIFS International Scholarship awards forty $1000 scholarships to students demonstrating a history of high academic achievement. Students must submit an essay on “How Studying Abroad Will Impact My Academic and Personal Growth”. The AIFS-NAFEO Scholarship is open to outstanding African-American students enrolled at one of the country’s Historically Black Colleges. The award pays for one semester of study in any AIFS program. The AIFS Diversity Abroad Achievement Scholarship provides $1000 for underrepresented or low-income students studying abroad for a single semester. Awards are determined by academic achievement and participation in community service organizations. International Studies Abroad (ISA) sponsors the Dr. Carlos Castaneda Memorial Scholarships. This program provides financial assistance to students wishing to study abroad in a Spanish-speaking country. Applicants may be studying any approved subject, and may be going for a summer, semester or year program. Awards are based on academic merit and financial need, and range from $1000 to $2500. The Spanish Studies Abroad Scholarship Program is open to students enrolled in study abroad programs in Spain, Argentina, Cuba, and Puerto Rico. Students may apply for either a merit-based scholarship or a diversity scholarship. Award amounts are determined by the course of study. Four $1000 scholarships are awarded for full semester courses, and five $500 scholarships are awarded for summer courses. Sweet Briar College, a liberal arts women’s college, offers their Junior Year in Spain Scholarship for its attending students. 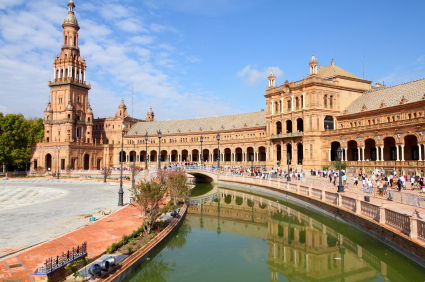 The scholarship provides up to $2000 per academic year for students enrolled in a study abroad program in Seville, Spain. The scholarship is renewable for up to three years. Applicants must have a minimum 3.0 GPA, and must be majoring or minoring in Spanish. The University of Iowa offers a number of undergraduate scholarships and graduate fellowships for students enrolled in one of the university’s many study abroad programs. Students may choose to study a wide range of subjects, including art history, business, education, and social science. Awards are determined on the basis of academic merit. Scholarship amounts range from $500 to $2000. Spain is a country with a rich, and diverse, cultural history. Students who get the opportunity to study in Spain will return home with a new perspective. Many college students assume that financial restrictions will prohibit them from studying abroad, but exceptional students with the desire to study in Spain will find a wide array of scholarship opportunities available to help them pay for their educational adventures abroad.